Most faces take between 3 and 10 minutes to complete. 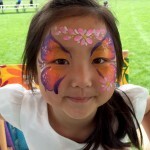 Estimate 8-10 kids per hour for face painting at a private party to allow for quality painting without the kids feeling rushed. At public events like fairs and festivals we can often simplify designs and paint more quickly to allow for more faces per hour. Are your products safe for my children’s skin? We use the highest quality professional body paints and glitters that are EUA/FDA approved. All paints, brushes, sponges and water are kept as clean as possible. 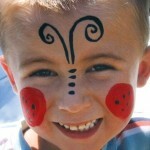 Face painting is best suited to ages 2 and up. 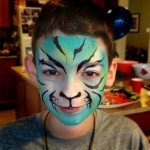 If your child is under the age of 2 we do not recommend painting their face. If your child has sensitive skin or a reaction in the past please ask for an allergy patch test prior to painting. Is there anyone you won’t paint? For safety reasons we may not paint a person with an open cut, cold sore, rash or cough which could be irritated or contagious. We may refuse to paint a baby under the age of 2, and will not paint any child that does not want to be painted. Do I need to supply anything for you at my event? I will need a regular height table to set up my paints on – please be sure to have this table ready in a well light area with room to accommodate a line of children. I will bring everything else that I need for your event. Paints are water based and easily removed with a cloth and warm water or a face friendly unscented wipe. For more stubborn areas I recommend an oil based make up remover. Now based in Collingwood, Ontario – travel charges may apply to locations that are 30 km or greater. Your booking is not guaranteed until you receive a booking confirmation. If your party or event has a theme we are happy to design new faces or learn your logo*. If we are painting at your party or event please have a regular height table available for your painter to work at. Reduced rates available for charities, non-profit organizations and bookings of 4 hours or more.